1. To describe feelings of excitement or enthusiasm about something or some kind of activity: The children were eager to go on the picnic. 2. Illustrating an excited expectancy, a keenness, or zealousness: Elvin's teachers say he is one of the most eager students they have known at the high school. 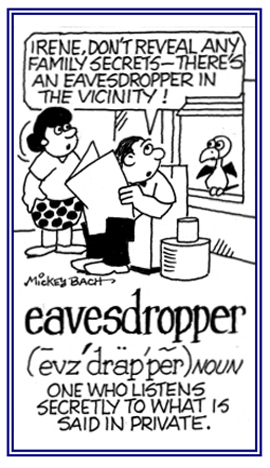 Someone who secretly listens to the private conversations of others without their consent: The eavesdropper in the story Mary was reading turned out to be the maid who overheard her master talking quietly to a young woman. Shirley was accused of being an eavesdropper on her brother's private telephone conversations. A woman adviser or counselor: Madelin was looking for a position as an egeria for students at the university. 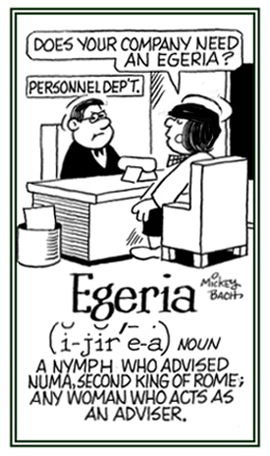 Egeria is originally the name of a Roman nymph or goddess who was an adviser to Numa Pompilius, a legendary Roman king. 1. To supplement; to supply by some means, whatever is lacking; to piece out; and also, to make a living with difficulty: The driver eked out the last bit of speed from his racing car. This family tries to eke out a living by selling wood carvings. 2. 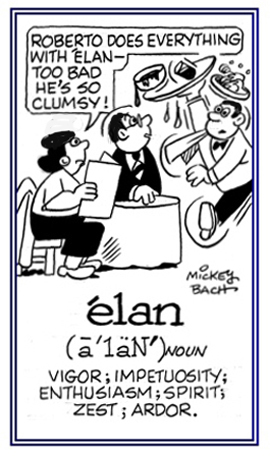 Etymology: from Old English ecan, "to increase". 1. A liveliness, vigor, and enthusiasm: The young dancers were full of élan as they were performing their final dance on stage. 2. A unique and stylish refinement: Joe was very impressed with Leah’s élan when he came to pick her up at home and gave her a bouquet of flowers. © ALL rights are reserved. 1.One of two large antelopes from Africa whose coat is light-brown or gray, the horns being twisted in a spiral fashion: Ted's children saw a video in their biology class that showed elands, about the size of elk, with their unique spiraled horns eating grass in their natural habitat. 2. Etymology: from Dutch eland, "elk"; from late Middle Dutche elen, elant; from German elen, elend; from Lithuanian ellenis, "stag". 1. To draw forth; to bring out: The lawyer tried to elicit a testimony from the reluctant witness. 2. Etymology: from Latin elicere, "to draw forth"; from ex-, "out" + -licere, combining form of lacere, "to entice". © ALL rights are reserved. 1. Evasive or crafty: They say that antelopes are among the most elusive animals to hunt. 2. Hard to comprehend, baffling: For many people, mathematics is full of elusive concepts. 1. That which is evasive or unapproachable: There was a quality of elusiveness about the painting that puzzled the experts. 2. Something that is difficult to grasp or to understand: Rodney was told that the speaker's elusiveness was an attempt to avoid telling the truth. 1. To become very weak and thin or to physically waste away: Debora's mother had an illness that emaciated her body so much that it resulted in a serious loss of weight which made her very thin and almost unrecognizable. 2. Etymology: "to make excessively thin"; from Latin emaciatus, and emaciare "to make lean, to waste away"; from ex-, "out" + macies, "leanness"; from macer, "thin". A reference to being abnormally thin and/or weak because of hunger, a disease, or lack of sufficient food: The illness left James in a more emaciated condition than the doctor expected. Janette was so emaciated that she was too weak to walk and so she had to use a supporting walker to get around. Because of the severe drought, many of the emaciated cattle on Jake's ranch were not expected to live much longer. A severe weight loss and wasting of the body because of malnutrition, starvation, cancer, tuberculosis, parasites, or some other kind of severe illness: The emaciation of the survivors of the ship that sank into the ocean was very severe and most of them could not walk and so they had to be carried off their boat into the rescue ship. The forest ranger explained that the emaciation of the deer in the area was caused by the extremely cold winter. 1. 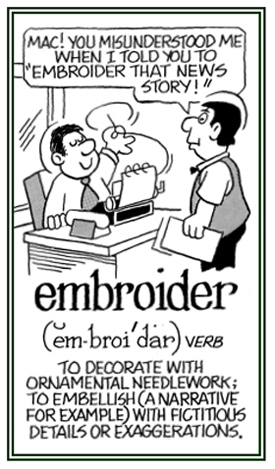 To stitch a decorative design of various colors on fabric with a needle and thread: For the topic of hobbies in her class at school, Theresa embroidered pillowcases to show the other students. 2. To add imaginary details to a narrative to make it more interesting or acceptable: While Tom was telling his story of how he had found a necklace, he embroidered his narrative by making it sound like he had discovered a vast amount of jewelry! © ALL rights are reserved. 1. The "Face with Tears of Joy" is a pictograph that has been chosen as "Oxford Dictionary's Word of the Year for 2015": An emoji is a small digital image, or icon, that is used to express an idea or an emotion in text messages or electronic communications. 2. 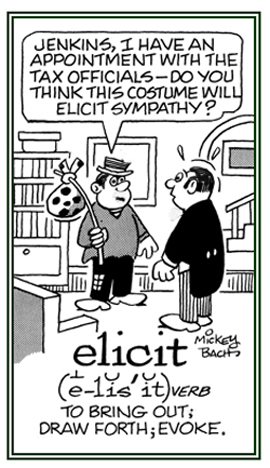 Etymology: from Japanese e, "picture" + moji, "letter, character". There are hundreds of other images showing emojis which can be seen by clicking on this Google link. 2. A facial expression pictorially represented by punctuation marks and letters, usually to express a writer’s mood or feeling: Emoticons are often used to alert a responder to a person's feeling or temper regarding a statement, that can change and improve the interpretation of plain text. 3. Etymology: a portmanteau word of the English words emotion (or emote) and icon: "On web forums, instant messenges and online games, text emoticons are often automatically replaced with small equivalent images, all of which are now called emoticons."